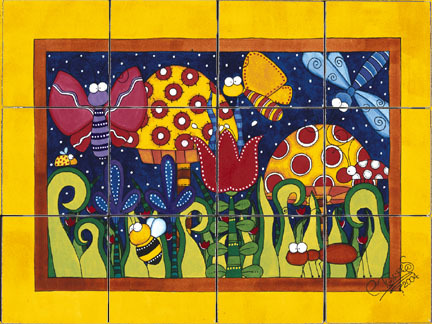 This unique bathroom tile adds an artistic flair to any kids' bathroom. It can be manufactured in different sizes to accommodate your unique space. We can produce it on a 4" or 6" tumbled marble that we supply with matte or glossy finish. There are 12 tiles total in this design. Please contact a Sweet Retreat Kids represenatative for a shipping quote. Full Description This unique bathroom tile adds an artistic flair to any kids' bathroom. It can be manufactured in different sizes to accommodate your unique space. We can produce it on a 4" or 6" tumbled marble that we supply with matte or glossy finish. There are 12 tiles total in this design. Please contact a Sweet Retreat Kids represenatative for a shipping quote.